Please accept my blessings. I beg to acknowledge receipt of your letter undated and I have noted the contents carefully. Our first business now is to establish at least three temples in India: One in Calcutta, one in Bombay, one in Vrindaban, and if possible a fourth one in Delhi. People should say that these Americans have come here and they have built this wonderful temple. We must do something tangible. Actually here in India the street Sankirtana Party has not got so much importance as in the U.S and other Western countries where Krishna Consciousness is being newly introduced. Here in this country if we are out on the streets too much, it will be misunderstood as begging. Here in Bombay I have instructed devotees only to go out on Sankirtana party if they have no other engagement. Simply to dance in the street and to eat and sleep, that will not be considered real preaching work here. If you establish a temple, that will be real pracara. I have given you the hint how to purchase the property- by making life members. Yourself, Acyutananda Swami, Jayapataka Swami and Hanuman can divide up and go and see important men. There are so many big men in Calcutta who can become our life members if you convince them. This requires unwavering strength and enthusiasm to fulfill the desires of the Spiritual Master. When my Guru Maharaja ordered me to spread this movement to the English speaking countries, I did not know how I could do it, but I never lost faith nor did I ever forget this order. Now I am wanting that we will have some temples here since our organization is international. And for this purpose money is required. One has to create money but you must know how to do it. So you have got the means to make life members. Distribute all of these books which we are getting and purchase that Hamilton Building. That will be your credit. While you are in Calcutta try and purchase the Hamilton property. If you find you are not able, then you can go to Gorakhpur as I have written in a letter to Jayapataka Maharaja but the best thing you can do is to work combinedly to establish a Calcutta center. Please offer my blessing to Acyutananda Maharaja and Hanuman Das. Hope this will meet you in good health. On October 28th, 1970 I had to advise you to transfer by mail Rs. 1,728 to your Gwalia Tank Branch in Bombay and the copy of the advice is sent herewith. The money was immediately deposited with your cashier and I possess the receipt slip, but here in Bombay your Gwalia Tank Branch says that they have not received the money. Kindly immediately inform me what is the fate of the money. An early reply will much oblige me. Please accept my blessings. I beg to acknowledge receipt of your letters dated 30th & 31st October, and 7th November, 1970. Yesterday evening Sagar Maharaja arrived well. From your letters, you seem to be a little unhappy so I would like you and Himavati to come here and live with me in Bombay as soon as possible. All the things which are being left behind should be taken and put under Jayapataka Maharaja's care, including my books, table, etc. The three sets of Deities should be taken to and kept safely by Jayapataka Maharaja at his new residence. In the mean time I am seeing to their clearance through customs by a clearing and forwarding house in Bombay that has a branch office in Calcutta, and I shall inform Jayapataka Maharaja when this has been arranged. Then they will be sent to the U.S.A. as we originally planned. So let Jayapataka Maharaja take good care of them in the meantime. Please see that the unpacked Deities are packed and boxed very securely, as are the others. Please give Jayapataka Maharaja the shipping documents for the Boston and L.A. shipments and tell him to momentarily not try to clear the books on his own as we are arranging for this clearing and forwarding agent to also handle the book shipments. So for the time being he should just keep the Bill of Lading documents safely in hand and eventually he will hand over the documents to the clearing and forwarding agent in Calcutta, whose address I shall inform him of later. Please immediately send me Jayapataka's new address and telephone number if there is one. Sagar Maharaja has told me that you and Himavati are not feeling well, so I hope your health has improved and you can come here as soon as possible. Please accept my blessings. I beg to acknowledge receipt of your letter dated 6the November along with enclosed plans for the Hamilton House. Regarding the Hamilton House, it is a first class building for our preaching work with its central location. My Guru Maharaja wanted us to open our centers in the most congested parts of major cities. We do not want a place in a quiet and solitary place, so offer them 6 to 7 lacs Rs. immediately. Start with 6 lacs and eventually you can offer them 7 lacs, but that is the highest you can go, and we shall arrange Rs. one lac in advance. If they agree, we will come immediately and finish the business. You should get the society immediately registered through Mr. Sen under the Societies act, not under the Companies Act. Please do this as quickly as possible, as men are expecting us to be a bona fide institution. I have asked Hamsaduta and Himavati to come and live with me here in Bombay. Now, I think the remaining members in Calcutta, except for yourself, can go to Gorakhpur, as Ramananda has asked for six more men. Since you are the president in Calcutta and there are so many businesses still pending, you should remain in Calcutta. I have instructed Hamsaduta to hand over to you for your sole care all the things that are remaining in 37/1 Hindustan Rd. flat, including my books, table, etc. In addition three sets of Deities there should be taken by you and kept carefully. See that the unwrapped set is securely wrapped and boxed as the others are. Also you can take from Hamsaduta the document Bill of Lading for the shipment of books from L.A. and Boston. I am arranging through a forwarding and clearing house in Bombay, which has a branch in Calcutta, to clear these books, so once I know the address of the Calcutta branch office, I will inform you and you may bring them the documents. I hope you have already sent by registered post my bank account passbook as asked you by telegram. So far as the 11,000 Rs. to be given by Sita-Ram Poddar, he can give the check in the society's name. We have also established an account in Bombay under the International Society for Krishna Consciousness. Immediately we have no South Indian program. Our first business is to go to Gorakhpur. So far, all of our success is due to our following the regulative rules of devotional service. So our good standing will be diminished if we join with groups who permit the use of intoxicants, etc. We should not compromise on this point, if we wish to remain pure and strong. Please write to Tamala Krsna at least once a week what are your activities. Please send me immediately your new address and telephone number if you have one. Please accept my blessings. I beg to acknowledge receipt of your kind letter dated 30th Sept, 1970 and I am glad to see how nicely you are reading my books. Please continue to do this. We need so many preachers who are soundly versed in the scriptures to convince the world to take to Krishna Consciousness. I am glad that you and the others are each writing one hour daily essays. That is parampara. All of our previous acaryas on our line have written substantially on the science of God-consciousness, so I would also like all my students to do this and I am very encouraged by this nice program you have initiated. Please offer my blessings to your good wife Vidarbha Kanya, as well as to all the other devotees there. Please accept my blessings. I beg to acknowledge receipt of your letter dated 28th Sept, 1970 and I have noted the contents. I am glad to see that you are taking seriously to spreading this Krishna Consciousness Movement to all your fellow Americans. Try and increase Sankirtana Party more and more to new areas and ever-larger circulation of our literatures. I am glad to read in your letter you are going to the universities to preach. The universities are very important places because there there are men who can appreciate our philosophy. So when you speak in the classroom, just quote from any of my books and then try and explain the meaning in your own words and the students will appreciate it very much. Please see that the schedule of offerings is done regularly without any break. To worship the Deity or to worship Panca-tattva means that there can be no upsetting of the schedule of offerings. You have seen our L.A. temple and how nicely the pujaris are doing everything. So, in the same way, try and make your worship equally nice. In that way you will have the full blessings of Srimati Radharani. I humbly thank all of the boys and girls who are living in the temple for helping me to spread this Krishna Consciousness Movement throughout the world. Please accept my blessings. I beg to acknowledge receipt of your letter dated 27, Sept. I'm very pleased that you're opening a nice center in the important city of Pittsburgh. Please develop the Pittsburgh and New Vrindaban plan conjointly. If Pittsburgh center can help contribute financially to our New Vrindaban, that will help relieve many financial problems. I am often thinking of New Vrindaban and I'm so much glad that you have taken the initiative to establish that program. Before I came to your country, I was thinking to establish an ideal Vedic community. So please work very hard to make New Vrindaban grow. I will agree with you that we must not strain by having more devotees there than we can fit comfortably. Things must be done in such a way that no one feels inconvenienced. That is one of the problems of our modern metropolis. Everyone is packed together so tightly that the condition is always unbearable. Develop things in New Vrindaban in the natural way, so that gradually, as you have more facilities, more men can come. So far as purchasing the property and schoolhouse owned by Mr. Caufield--that is very nice proposal. So I propose that if you can collect $15,000. Then I will loan you the remaining $5,000. from my bookfund. Your essay, The Spiritual Master: Emissary of the Supreme Person, is so nice, so why not have ISKCON PRESS publish it and then all our students can study it. Here I am working in Bombay to establish one Krishna Consciousness Headquarters for India. There are many big influential industrialists in Bombay and the climate is very nice. So it Krishna desires, we will have a temple here. If I get such a nice temple, I may call all the men who are in India to come here, and at that time you may come also. Presently Hamsaduta, Acyutananda Swami, Jayapataka Swami, Madhudvisa Swami, and some others are in Calcutta. Kirtanananda Swami is with Ramananda in Gorakhpur and Gurudasa and Yamuna with some other devotees are in Delhi. So everyone here is trying to establish a temple and we will see where Krishna wants us to have it. Please offer my blessings to your good wife Syama Dasi and your growing boy Samba, and I can hardly wait until he grows big enough to defeat all the mayavadis. Please accept my greetings. I beg to apologize for not keeping our scheduled appointment on the morning of November 3rd. I became ill due to exhaustion from too much travelling and was not able to leave my room. I have been told by my disciple that you have kindly agreed to donate 500 rupees to our society. There are many beautiful books which our society has published within the last few years and which many of the gentlemen of Bombay are now receiving as life member of our society, and take advantage of these wonderful Krishna Consciousness books. The membership fee is 1111 rupees. I should very much like to see you, as this is one of the reasons I have returned here to Bombay. So when you are feeling fully rested, I hope you will arrange an appointment at your convenience. Please accept my blessings. I beg to acknowledge receipt of your letter dated November 2nd, 1970. Perhaps you have received my letter sent to you earlier. Please see Atma Ram & Sons book distributers on Kashmere Gate, New Delhi (Isha Kumar-proprietor). Isha Kumar as always been very respectful towards me. You can show him all our books and if he is interested, he may become the sole selling agent in India for my books and he will get a 40% discount, but he must order at least 200 copies of each book. Instead of engaging in Sankirtana if you, husband and wife try to see so many government members and ministers and other important men, that will be nice. You may try and see Indira Gandhi. And perhaps you can meet with this president Giri shown in the enclosed news clipping. I think because your pictures are shown together with his, he will meet you. There is an old friend of mine named D. R. Gupta on 4 University Rd. You should make arrangements to see him by telephoning him. If he is favorably impressed, he will certainly become a life member. That is what I want you to do while you are there--to try to make as many life members as you can. You should certainly see J. Dalmia for Scindia House, New Delhi. He will become a life member and he can suggest others who may also become life members. He is a relative and very close to Ram Das Dandaria. Also you can see his big brother Ram Krishna Dalmia and make him a life member. His daughter came to London, Ascot to see me. If there is any difficulty in staying where you are, you can ask J. Dalmia to provide accommodation in Birla's dharmasala. That dharmasala is a very good place with lecture hall. You can speak in the lecture hall in English and you can advertise for members and they will appreciate it very much. I've received a letter from Bali Mardan and he is very eager to carry on with his GBC activities. So he will not be resigning from his post and will continue in his position. Also I've received some other letters and things in London are not as they should be. It seems that Murari has now become president of London temple. This is all right for a while but you will have to go back to the London temple. London temple is one of the most important centers in our society and it should not suffer for lack of good management. Under you and your wife's good care, things have gone very nicely there. So I want you and Yamuna to both be prepared to go back to London in the near future. You have come all the way to India, so for the time being you should remain here and see what can be done in Delhi. I just received one letter from Radha Madhava Sharan and he has informed me that a big temple and compound belonging to the Maharaja of Bharatapur on the bank of the Yamuna at Kesighat is for sale. Therefore I would like you to go immediately to see Radha Madhava Sharan in Vrindaban (Address: 2/157, Radha Raman; Vrindaban; U.P.). You can go and see the sight and find out exactly from him the terms of negotiation of purchasing the temple and property. When you have understood the terms, you can go to Bharatapur along with Radha Madhava Sharan, taking him at our expense, and find out the exact person with whom the negotiations should be finalized. If everything is in order and the property can be purchased, then remain in Bharatapur. If the transaction is to be done there, you stay in Bharatapur and telegram me immediately. I will come myself and complete the purchase. We would like to get this temple and land at all costs, as it is very nicely situated on the Yamuna River. I know of this temple. I used to live next to it before living in the Radha-Damodara temple. It is a very palatial building. The remainder of your party, including your wife, may remain in Delhi under the leadership of Giriraja Das Brahmacari and see the men whom I've mentioned above. Please accept my blessings and offer the same to Gaurasundara. I am in due receipt of your letter dated October 5th, 1970. Now I am in India, extensively touring all over the land. From Calcutta I have come to Bombay, then from Bombay to Amritsar, then again down from Amritsar to Bombay, for the last two months. I am trying to establish a center in Bombay along with some influential friends. Your description of past incidents may be forgotten. We are not concerned with past misunderstandings; we are concerned only with progressive service to Krsna. I know that both you and Gaurasundara are sincere devotees and you have done your best in Hawaii in accordance with my desire and the luxurious growing Tulasi devi is giving evidence of your sincere devotion. Kindly take care of Guru-Gauranga, Radha Krsna and Tulasi devi and be happy. Try to make others also happy by spreading this Krsna Consciousness. I like the place Honolulu very much. Last time where I stayed in the skyscraper hotel was extremely pleasing to me, therefore I was induced to stay there for some time. I think that was my sense gratification, therefore Krsna liked me to come here and do some work. We shall always be satisfied with the routine work entrusted to us by Krsna. I hope things are going on well there. In the meantime I am enclosing one circular letter to whom it may concern and I authorize you to print them profusely and distribute to the public so that the misunderstanding created by Sai may be dissipated. Please keep me informed of your activities and I shall be glad to receive my maintenance charges regularly. I am always thinking of returning to Hawaii again and staying there conveniently. It is a very nice place. Hope this will meet you in good health. Please accept my blessings. 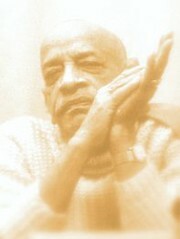 I have not received any letter from you since I left Calcutta--neither from Kirtanananda Swami nor Acyutananda Swami. I do not know how things are going on there. I shall be glad to hear of your activities and enrollment of life members. In the meantime, I've received one invitation from Madan-mohan Mintri (enclosed) which speaks for itself. The copy of the reply is also enclosed herein. If you receive any letter from him, you can consider the case for going there with him with full party.